Length 150 cm, Width 2 cm, Size Medium; The lead does not stretch itself. This lead is a single product. However, it comes with matching collar/harness to complete the look. Collar and harness sold separately. Simple yet charming, this sweet dog leash is designed in a baby pink color and looks good on all the breeds. Inspired by the spring flora and scents, this designer dog leash will bring both style and comfort to the most playful member in your family. Easy to care for, these soft, comfortable leashes are even machine-washable. With the heavy duty spinning snap, this nylon strong dog leash is designed to last long. Don’t miss out this deal for Christmas celebration. Length 150 cm, Width 1.5 cm, Size Small; The lead does not stretch itself. Summer News – this spring loving daisy print is going to stay your loved companion’s wardrobe and be your pups new favorite. Think of going to a branch walking your pups with this beautifully designed dog leash on, you are sure to be the center of the park! 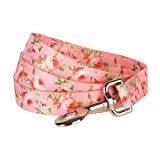 Because this dog leash has the ultimate spring loving design not only the print but also the style. What are you waiting for? Prepare your pups to get into the spirit of our favorite season – the spring. Neck 37cm-50cm, Entire webbing width 2.5cm, Ribbon on neoprene layer width 2cm, Size Medium; The collar does not stretch itself, please make sure leave only 2 fingers between collar and dog neck. The collar is a single product.However, it comes with matching lead/harness to complete the look. Lead and harness sold separately. Made of high density dark orchid polyester webbing with a comfy neoprene bottom layer; The dark orchid buckles are made of ecofriendly plastic. The metal D ring is chrome coated to add durability. 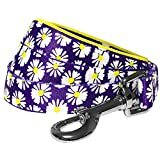 Summer News ¨C this summer loving daisy print is going to stay your loved companion’s wardrobe and be your pups new favorite. Think of going to a branch walking your pups with this beautifully designed dog collar on, you are sure to be the center of the park! 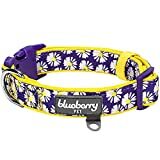 Because this dog collar has the ultimate summer loving design not only the print but also the style. Another reason you should get this collar now is the super soft neoprene layer, which exhibits good stability and maintains extra comfort for this warm season. This fashion dog collar is perfect for every day use. What are you waiting for? Prepare your pups to get into the spirit of our favorite season.